Show off your Dwm configuration! Welcome all dwm users! Post a screenshot of your desktop and optionally along with your configuration files. I combine the work and play workspaces to prevent myself from doing both! /* See LICENSE file for copyright and license details. * allowed to select for this event mask. * Keys and tagging rules are organized as arrays and defined in config.h. * To understand everything else, start reading main(). xsetroot -name  "$(date +"%a %b %d %r")"
PS: How do I use thumbnails in my post? Look at the start of the monthly screenshot threads for instructions. Do you start your wallpaper at startx , if yes how do you do that? test -x "$file" && echo "$file"
No changes made to vanilla dwm.c after 5.3. I just do that and it's doesen't work hmm maybe i have to put sleep 1 comand in my .xinitrc? Note wallpaper is a script that copies a random picture from my Pictures folder over to .wallpaper.jpg (so i have changing wallpaper on every boot/startx). Ok that's works thanks TjPhysicist. Just tested 5.5 and pertag doesn't come by default and the pertag patch (for 5.4) isn't working anymore. OK, got my thumbnails working! I also added my .xinitrc for those who want to know how to use a wallpaper. 5.4-pertag works fine here on 5.5. if you're using multiple patches maybe apply them in a different order? Applied it and re-diffed it so won't have the 15 line difference maybe it'll help. 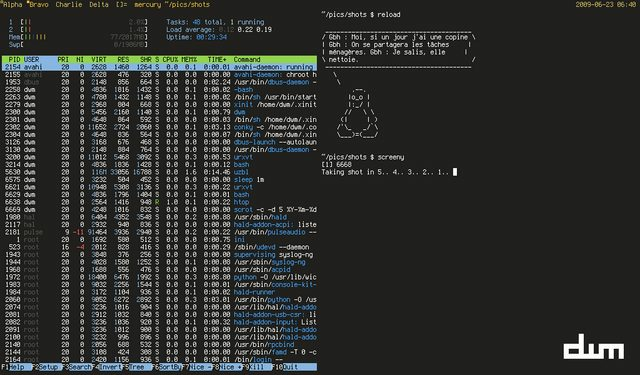 cdwillis, what is that program you used in your terminal to show that tux ascii art? 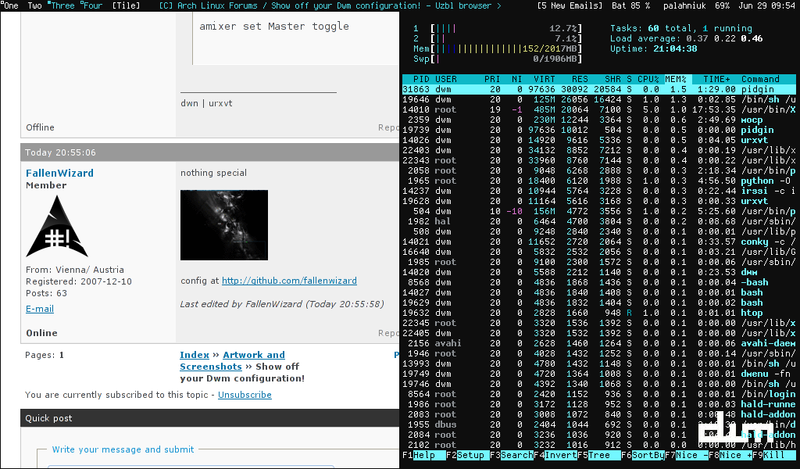 zowki: it's called cowsay and it's in the repos. O i see, i guess i'll do that. This is influenced by the Kilosecond thread and wikipage, it displays the time in planck. (well Yota-zeta planck, i.e. 10^46planck times).